Plushies pictured here: (back row) Jennifer Franklin's Zombie Cut and Sew Doll, Shelleyfaye's Skelley Baby Doll, and Retro Rudolph's Zombie Skelly Panda and Casual Green Ghoul – reversible doll; (middle) My Zoetrope's Cutie-Cat Pumpkin Pillows; (front) Amel24's Halloweeny Plushies. Trick or Treat! It's a Halloween plushie party in the Greenhouse here at Spoonflower's Durham, NC headquarters! 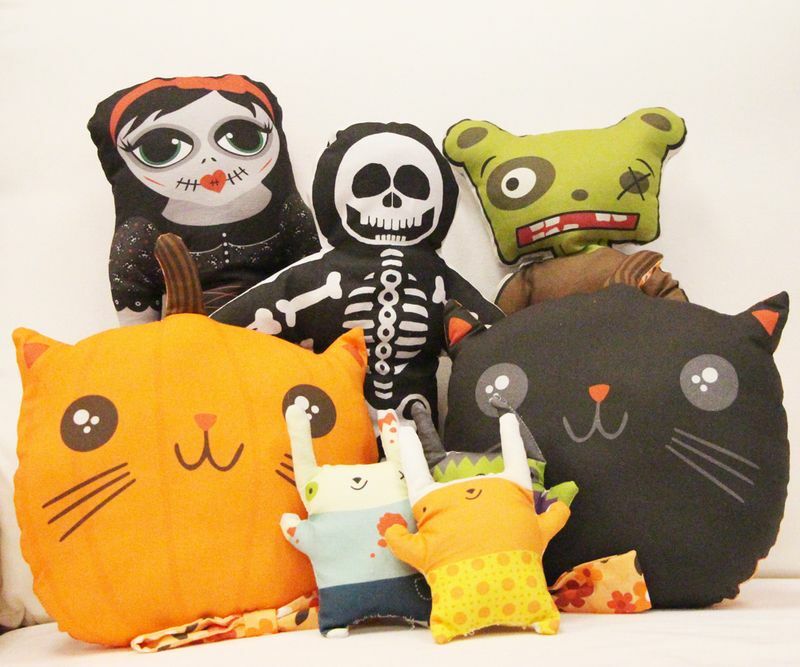 Join us to sew Halloween-themed plushies as Spoonflower's own Michelle Swart leads a basic sewing workshop for kids on Tuesday, October 22, from 4-5:30pm! This class is designed to be an introduction to hand sewing, and students will learn each step in creating their own stuffed toy from a cut and sew pattern. Michelle will cover everything from threading a needle to cutting pattern pieces and assembling a plushie for students to take home. We're printing some of our favorite Halloween themed toys (including several from last year's Zombie Plush Toy Design Challenge!) for folks to choose their favorite, and all materials for this class will be provided! This class is open to kids aged 10-16 years old, and no previous sewing experience is necessary. Head over to Eventbrite to reserve your child's spot in the class starting this evening at 6pm!